If you’re truly a hardgainer and find it nearly impossible to gain weight, the solution is almost always the same. My guess is that you already know this. But knowing is only half the battle. I mean it’s easy for me to give you a simple formula to help determine how much you’ll need to eat. But knowing exactly how much you need to eat (alone) isn’t going to put size on you. You’ll actually have to eat enough, consistently, before you can expect to move the scale. But we’ve always been skinny for a reason. Our energy needs exceed our appetite. Plain and simple. And if you’ve ever attempted to gain weight, then I think we can both agree that it’s no easy task. While most people could only dream of having this “problem”, for us it’s a nightmare that we can’t seem to wake up from. Believe me, I know. Because before I was able to finally transform my body, my appetite was the biggest obstacle. You see, although I knew how much I needed to be eating, it was easier said than done. Does this sound like the issue you’re having? In this article I want to share 5 simple hardgainer strategies that you can use right now to help increase your appetite so that you can eat enough without having to force feed yourself. Now I’m not saying that you’ll have to implement all of these strategies, but whether you use 1 of these techniques or all 5 of them, eating enough on a consistent basis will no longer seem like a chore. 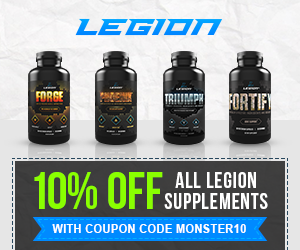 Are you ready to increase your appetite and finally be able to put on mass practically on demand? Essentially it’s just a tool that trainees can use to reduce caloric intake, effortlessly, by reducing the amount of the time during their day in which they are allowed to consume meals. Well if decreasing your “feeding window” works as a tool to ensure we are not overeating, then increasing that feeding window in order to fit in more calories makes sense. So if you’re getting up at noon and going to bed at 11pm (as an example), then you’ve got 11 hours to stuff your face. Instead, try getting up a few hours earlier (9am) and that’ll allow you to, effortlessly, fit more meals/calories into your day. Perhaps you’re already getting up fairly early. Maybe you’re just not hungry when you wake up and end up fasting for a few hours each morning. Simply adding in a breakfast meal or shake upon waking can add anywhere from 250-500+ calories to your day. This could be the difference between being at maintenance and reaching that necessary caloric surplus. Adding that breakfast meal may seem tedious for the first few days, but eventually you’ll begin to adapt and notice yourself already hungry as you wake up. When it comes to building muscle and maintaining overall health, there is plenty of scientific evidence that tells use exactly how much protein and fats we need in our day. However, too many fitness “gurus” whose main agenda is to sell us protein supplements, tell us we need more than we actually do. So we pound down protein shakes like they’re going out of style. Problem with that is, protein is the most satiating macronutrient of the three and it’s keeping you full for long periods of time. On top of that, our super human metabolism justifies all the junk food* we throw in our diet. So we end up over-consuming protein and fats and wonder why we’re never hungry. Have you ever sat down to have a greasy burger and fries? You probably recall being stuffed for the next 6 hours or so. Now let’s look back at the time that you decided to have the grilled chicken sandwich with the fruit cup on the side. You were probably ready for another meal an hour later. This is not to say that you should always opt for the “cleaner” low-fat choice. But aiming to reduce your total fat and protein intake (assuming you’re going over the necessary amounts) while increasing your carbs will make it much easier to fit in more meals and more daily calories due to reduced fullness. Read this to ensure you’re getting enough protein and fats. The See Food Diet: You see food, you eat it. 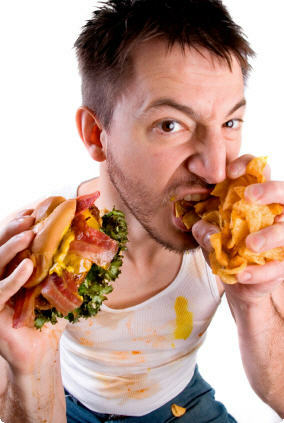 I’m sure you’ve had a friend (or two) tell you to eat everything in sight if you want to gain weight. Hell, that’s the first piece of advice I got when I started lifting. But here is the problem with this approach. On day 1 you eat everything in sight. You’re eating peanut butter straight from the jar and you’re pounding away pizza like you’re in an eating contest. Congrats! You’ve consumed more energy than you expended. You met (or exceeded) your calorie needs. But what happens on day 2? Yep, you guessed it! Your appetite is completely gone. You can hardly stomach a cup of applesauce. Congrats! You’ve eaten far too little to meet your caloric surplus. In fact, you couldn’t even muster up the appetite to hit your maintenance calories. So day 1 you over eat and day 2 you under eat. By the end of the week you’ve managed to maintain your current weight. So here’s what I recommend instead. You’re not getting skinnier but you’re certainly not getting bigger. This is because you’re eating at maintenance. So let’s say that you’re, on average, consuming 2500 calories per day. That amount is just enough to maintain your current bodyweight. 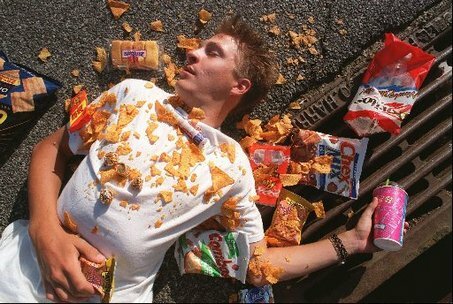 Instead of aiming to stuff your face using terrorist torture methods, simply aim to eat slightly above maintenance (i.e. 2600 calories). Adding an extra 100 calories to your day is as easy as throwing in an extra handful of almonds. Now you’re in a surplus and eating enough to gain weight without having to drown yourself in food. 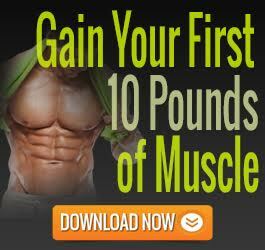 Most people have probably told you that in order to build muscle you’ll have to eat 6 meals per day. And although this is old-school bodybuilding methodology that has been disproven, I believe there is still value there. The human body is extremely adaptive. Going back to solution #1, a person who never feels hungry in the morning can force themselves to eat at breakfast time for a bit until the body naturally adapts. At that point you’ll naturally become hungry and consuming a meal upon waking is no longer a chore. Although there is no magic number of meals we must consume daily, sticking to an eating schedule will force adaptations and thus, eventually, we’ll be hungry every few hours (or however often your schedule required). Correct me if I’m wrong. Right now you’re probably eating twice on some days, 3-4 times on others, and occasionally getting by on 1 meal. The inconsistency in your meals is creating an inconsistency in your appetite. Sometimes our appetite is actually not a problem. We just get so busy that we forget to eat. If your appetite is not necessarily the culprit for your inability to gain weight, then perhaps you just need convenience. This brings me to solution #5. Start including a high calorie, nutrient dense shakes to your day. These shakes can add an extra 600-1000 calories to your day in minutes. And because it’s liquid, they tend to digest a bit faster which eliminates the prolonged fullness that typically comes with a high calorie meal. Implement the solutions I’ve listed above and make eating enjoyable again. There is a reason that force-feeding is a commonly used torture method. Because it’s exactly that, torture. 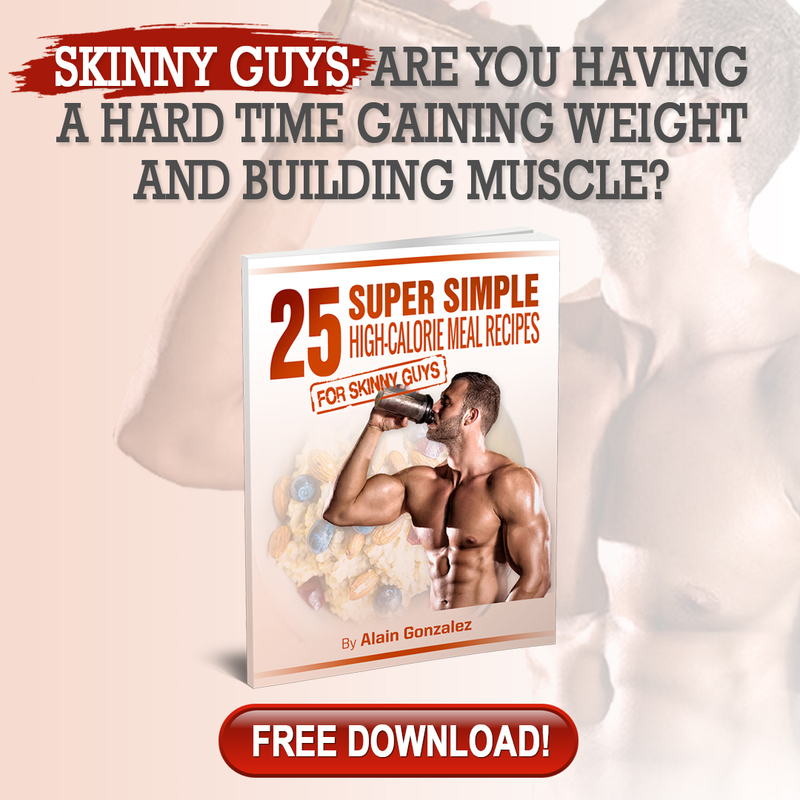 Still need help with your weight gain goals? 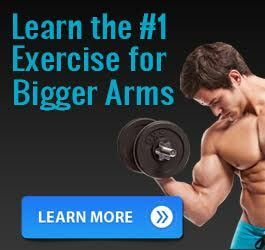 Perhaps you’re looking for a solid hardgainer workout program. Or maybe you want to eliminate the guess work and follow a strategic meal plan instead. 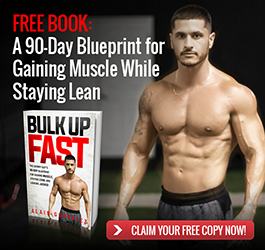 If so, check out Bulk Up Fast. 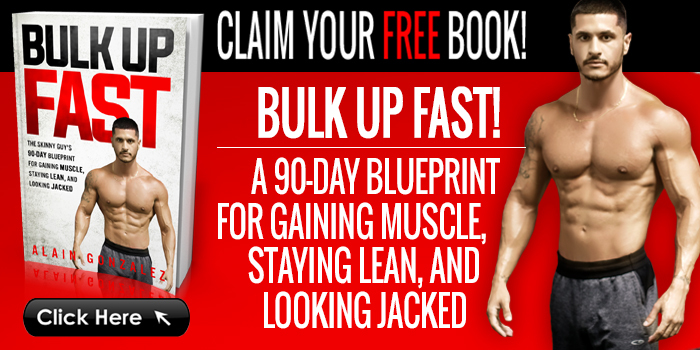 This is the exact system I used to transform my body from a 107 pound skinny weakling to a jacked powerhouse, all while training just 3-4 days per week. Make sure to “like” and share! Have any questions? Leave them in the comment section below! No question goes unanswered. If your weight is inconsistent, it’s because your nutrition and/or activity level aren’t consistent.